Support for Federal Employees on Long Island – Half Hollow Hills Teachers Association | Love what you do. Today is day 35 of the federal government shutdown. Impacted federal employees have now gone without two paychecks. There are 26,000 federal employees who live in Suffolk and Nassau. With numbers like that, it wouldn't be surprising to learn that we have members whose families have been impacted. Beyond them, we have students, patients, clients and patrons whose families are hurting now too. Below are some resources for federal employees on Long Island that may be of some help to any members impacted by the partial government shutdown. Please share with whomever you can. While these resources may not address all of a person's needs, they can hopefully help to ensure that someone is not overwhelmed by this crisis. 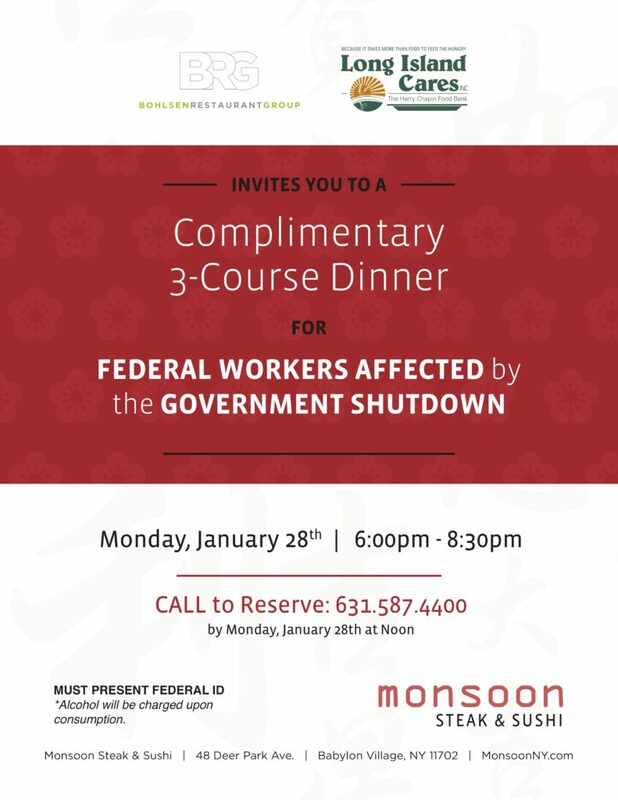 LI Cares & BRG- Complimentary 3 Course Dinner: Monsoon Steak and Sushi in Babylon Village is offering federal employees a 3 course meal on January 28th (6:00pm - 8:00pm). Call 631-587-4400 to make reservation. Must present federal ID (alcohol not covered) See flyer below.